Returning volunteers, the volunteer requirements have changed! Training is no longer required for volunteers but those wishing to work in the classroom or chaperone field trips must submit a background check online and complete paperwork with your child’s teacher. 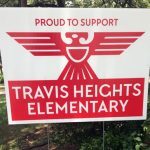 See www.travisheightselementary.com/volunteering/ for more details on completing the background checks. All new volunteers are encouraged to attend a Volunteer Orientation. We’d love all volunteers to complete a new Volunteer form so we can update everyone’s interests and only email you about areas you are interested in. Use the form in your folder today OR complete it online. For all our new and returning T-Bird families, Friday (9/1) is our first Upper Grade Assembly – 3rd-5th Graders. Next Friday will be Lower Grade Assembly – Kinder-2nd Grade. That means you drop your child off in the gym on your respective assembly morning (i.e., drop off in gym by 7:35). Parents are always welcome and encouraged to join us for assembly – it’s a lot of fun! You’ve seen the new shirts around school and have been super jealous of all those ??  (lucky ducks) who got them at the ice cream social – but now you can get yours too! and Sept. 7th 5-6pm (Back to School Night). 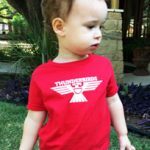 Show off your Thunderbird pride. Quantities very limited so don’t delay! 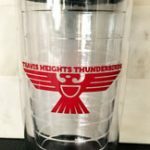 Let the neighborhood know you support the Thunderbirds. routines/expectations, what your child will be learning this year, and how you can help from your child’s teacher. Q&A. PLEASE NOTE: Unfortunately, here is no childcare available during this time. Please leave children at home. 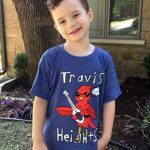 5:00-6:00 – (Kinder-5th) Visit our Art room, Music room, Computer Lab, Library, and Gym. Stop by the tables in the front entrance to learn how you can support your school. Note: Classrooms will be off-limits during this time. Pizza will be served in the cafeteria from 5-6 p.m . . Please bring a salad or side to share with others. 6:00-6:25 – Join us to meet the administration, teachers and PTA Executive Board. Hear updates on the school; learn about our upcoming special programs, & events. You’ll also have the opportunity to ask questions about and vote on the PT A budget for the school year. routines/expectations, what your child will be learning this year, and how you can help from your child’s teacher. Q&A. 7:15-7:55 – Classroom #2: For those with more than one child, hear a repeat of the above information. Child care will be provided for the meeting immediately after teacher presentations. This allows parents to have an uninterrupted time to listen and talk. Bring your general questions regarding the grade level procedures and academic expectations. Be ready to listen and share openly. This is the first step to building a learning community for your child for this year. Remember (how can you forget?) there is NO SCHOOL on Monday Sept. 4th!